In early Spring, before the trees were fully green and the flowers bloomed, we got to meet William and Daniela for the very first time. William and Daniela are full of laughter and the most authentic of loves - they have been together ten years, and have known each other longer then that. They're the kind of couple who knows each other to their core. Their sweet romance was evident in every way they shared together, telling us the stories of how they met and became engaged. Walking the River Arts District with these two was truly a treat. I remember our first conversation months ago, during their consultation. They told me about their style, what they liked and disliked when it came to photography, and of course I heard a lot about their sweet dog, Luna. Dogs are often the first bit of family a couple chooses to create together, so including them in engagement photos is always an absolute must. Daniela's parents were nearby to help with Luna, so before we wandered away with the couple, we were sure to include her in a few sweet moments. That face! The sweetest ever. After Luna went back to relax and take a break from her time in the spotlight, (it's rough being so high-demand;)) we kept William and Daniela for ourselves to wander the River Arts District and find some really rad murals and graffiti to enjoy. It was really the perfect spot for these two to celebrate their relationship. 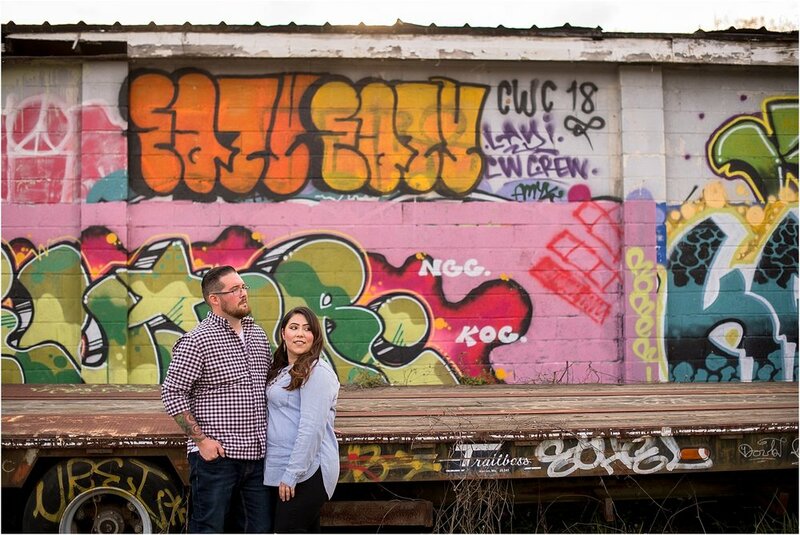 Full of color and personality themselves, the bright and raw nature of the River Arts was a great compliment to everything William and Daniela are. Although originally from New Jersey, William and Daniela call the beach of South Carolina their home. Throughout the time they have been together, though, there's always been something special about the mountains here in Asheville - a place that continually draws them back time and time again. In fact, these mountains are the very same ones where William proposed to her, in an intimate, riverside setting on an especially rainy day. Sometimes, after years together, your heart confirms what it already knew - that you were always meant to be together. And although William and Daniela's love isn't 'new', it is vibrant and it is genuine, full of the good things that every long-term relationship needs. With them, we heard lots of laughter, and when there wasn't laughter, there were those thoughtful, wistful glances that you only get on occasion, the way you look at the love of your life after only years together. Remembering how far you've come together is tremendously beautiful, and looking forward to where you are going even moreso. William and Daniela carried that authentic, real life love so naturally as we walked the muddied roads together. Engagement sessions with us are pretty unscripted and natural - we'll usually scout a location based on the couple's preferences, and then wait to really soak it in until we're with the couple. In this space, we were drawn to the color and contrast between nature and industry meshing together. But as we photographed, we noticed 'Love' written at the top of an abandoned roadside truck - the perfect surprise to fill our our frames. Although Daniela and William love the urban vibe of Asheville and the raw, gritty environment, they also love the outdoors and of course the picturesque mountain views. With just a little bit of light left, we headed to Carrier Park right next door to the River Arts District to snag a bit of the nature's goodness for their engagement session. With Spring not quite fully bloomed, we got to capture the bones of nature and have Daniela and William take that spotlight. Although the clouds threatened to cover the sun, the golden hues still burst from the sky. William and Daniela, thank you for letting us be a part of your story! We had so much fun with you guys and absolutely cannot wait for your wedding this November!